The Small Cassiopeia crossbody bag, named after the beautiful Greek Queen, is both a useful crossbody bag and a statement piece. 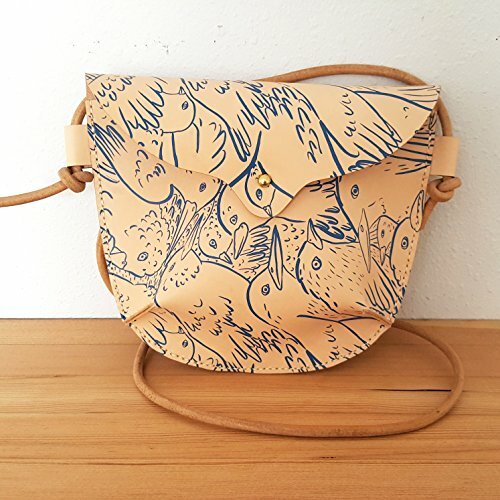 Hand screen printed pattern on vegetable tanned leather. Entire bag hand stitched with waxed thread. Adjustable 60" leather cord. - Measures 9"x8" with 3" gusset - Adjustable 60" leather cord - Spot Clean only - Vegetable Tanned English Bridle from USA tannery - Hand Stitched This item was hand printed and constructed in my Portland, OR studio. Because all my products are truly made by hand, variations and blemishes may occur, making each item a unique work of art. All item are made to order. Please expect about 2 weeks before shipping. If you have any questions about this product by Chloe Derderian Gilbert, contact us by completing and submitting the form below. If you are looking for a specif part number, please include it with your message.